There is something slightly annoying about the way the mailbox drawer in Mac OS X’s Mail responds to user actions when the user tries to drag a message or a selection of a messages to a specific mailbox folder nested somewhere within his mailbox folder hierarchy. So far so good. 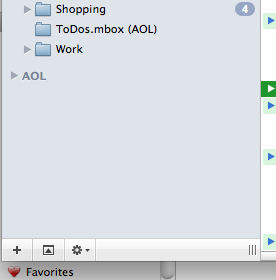 But let’s say the enclosed folder to which I want to drag my selection is lower down in the list. In order to reach it, I will have to scroll down the list of enclosed folder. But I have my index finger on my primary mouse button, because I am dragging stuff. So I cannot use the scroll wheel for this. The expected standard behaviour in such a case is that, when I drag my selection near the bottom edge of the drawer and wait for a fraction of a second, Mail will start scrolling down the list to reveal the rest of the enclosed folders. But that’s where there is a problem. 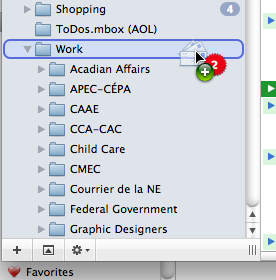 The “near the bottom edge of the drawer” area that I am supposed to target with my dragging is not clearly defined and, more important, it overlaps with the area where one of the enclosed subfolders appears (in this case, the folder called “Graphic Designers”). But that’s not what I want! 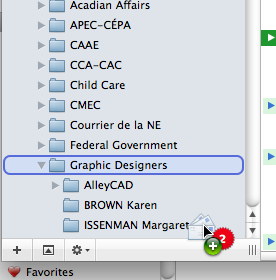 I do not want to drag my selection to a sub-subfolder inside the “Graphic Designers” folder! 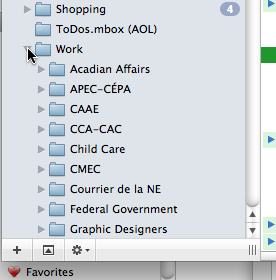 I want to drag my selection to a subfolder after the “Graphic Designers” folder. Unfortunately, because of the overlap between the area that triggers scrolling and the area that triggers spring-loading, I cannot have one without the other. And the end result is that I have to scroll down through the list of sub-subfolders first before I can reach the rest of the list of subfolders. Fortunately, Mail doesn’t continue this silly behaviour ad infinitum. Otherwise, it would be a nightmare. It only confuses scrolling and spring-loading once, presumably because after that, since the drawer is scrolling down, I am not longer lingering on any given position long enough to trigger spring-loading, until I actually choose to stop the scrolling by lifting my selection back up a bit. And once I’ve actually dropped what I was dragging in the desired location and released the mouse button, of course Mail collapses everything back up and I am back to normal. Still, it’s quite frustrating that, almost every time I want to archive something somewhere inside my hierarchy of mailbox folders, I am forced to deal with this confusion between scrolling and spring-loading and scroll through more things than I should have to. Given that this is a problem that only affects people with a long list of folders in their mailbox drawer, and not the majority of users who never archive their mail outside their inbox and let it balloon up to thousands of messages, I wonder whether Apple is even aware that there is a usability issue here and, if so, whether they can be bothered to think about a way to fix it. Admittedly, it’s a small problem, and one that I have learned to live with. But it still grates that I always have to do more scrolling than should be necessary and deal with unwanted spring-loading which, as far as I can tell, cannot be turned off (and one wouldn’t want to turn it off anyway, since it is necessary; the only option would be to turn it off only in this particular area of the drawer). I have a few AppleScript scripts and keyboard-activated Mail Act-On rules for moving stuff to my most frequently used destinations, which helps alleviate the problem, but I cannot have a rule or script for every possible destination, so I still have to deal with this problem on a daily basis. And that, in my book, makes it more than a “minor” annoyance. This entry was posted by Pierre Igot on Wednesday, January 13th, 2010 at 12:35 pm	and is filed under Mail. You can follow any responses to this entry through the RSS 2.0 feed. Responses are currently closed, but you can trackback from your own site.